Obama sez I can nawt has my G650? OK, I know that politicians are guilty of this all the time. For years they have played one group against another. They learn it as little kids. My wife says children are born innately knowing how to do three things: unscrew Oreos, eat Jello, and play one parent against the other. I’ve never seen a reason to argue any of those points with her. Obama is a master of this, though, and he is finding new and bizarre ways to do it that have to even make his supporters scratch their heads. His campaign speech – excuse me, press conference – yesterday, was a case in point: and that doesn’t even include using the term “busted transmission,” which has to be a first in Presidential rhetoric. You learn that stuff at Harvard. Let’s look at that for a moment. Why did he choose, out of all the possible places revenue could be generated, corporate jet owners, oil and gas companies, and millionaires and billionaires. Here’s a good example: back in 1990 Congress passed a 10 per cent luxury tax on all boats built in the US that cost over $ 100,000. It almost killed the boat-building industry in the US. Those with the money to buy boats at that price level either didn’t buy or bought overseas. The tax brought in very little money, and thousands of jobs were lost, particularly in the Northeast. The tax was lifted in 1993 after intensive lobbying by the industry, and luckily most of the skilled labor was still available and many of the buyers were willing to buy, so the industry was able to bring itself back up. Why did Congress respond so quickly? The jobs were being lost in the northeast, in a liberal part of the country. (This was before the takeover of Congress by the Republicans in 1994.) There was also a lot of work done by a few very, very energetic members of the industry to get the information into the hands of the Congressmen. Most of those boats were owned by individuals. They were used for vacations, not business, the majority of the time – not that many didn’t have a significant role in business as well. Corporate jets are a bit different. Very few are owned by individuals. Even Steve Job’s jet is owned by Apple, not by Steve. OK, Rush owns his, but the vast majority are owned by companies or by fractional ownership companies like NetJets. The are simply too expensive to maintain. The point of a company having a private jet is to save time. Time is money. If an important person in the company has to be somewhere, and has to waste most of a day flying commercial, his time is wasted. You can’t get it back. If you are paying him millions of dollars a year, having a jet to fly him to his destination when he needs to go makes more economic sense. That’s why fractional ownership has been growing. 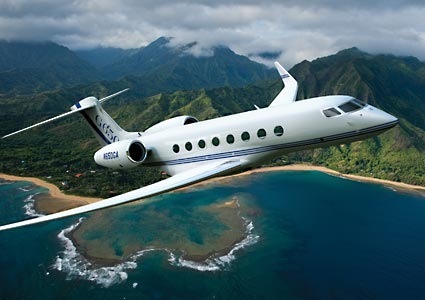 Companies that couldn’t afford a jet because they wouldn’t use it enough could buy enough time for their needs. Here’s where Obama’s example breaks down. Tax them heavily and the companies dump their jets. The jet manufacturers (in the US, Bombardier, Gulfstream, and Cessna, and foreign-owned but built here, Embraer and Hawker Beechcraft) took a huge hit a couple of years ago when Obama targeted the companies with private jets. In fact, the CEO of Cessna took him to task publicly for it. They would again. We would probably see one or two of these die off, and the companies would eventually buy from a foreign company like Dassault. Honda is even working on fielding a small corporate jet. Gain – limited tax money, for a year or two. Loss – long term US job loss. Nice work, ace. Not even including the loss of productivity of the folks who are supposed to be using the jets. And as Rush pointed out, who has the biggest corporate jet of all? A Boeing 747, at his beck and call any time he wants? But he needs it, and flies all over the world with it. How many trips has he taken? Let’s look at the other side of his little examples. Why is the Federal government giving college scholarships, again? Where is that in the Constitution? How do I apply for one of those? Research is a slippery beast. For example, when NASA says they are working on a new rocket, they do some in-house design studies, maybe, then do a request for proposal and see what LockMart and Boeing come up with. Those research costs are covered in the cost of the vehicles when the government buys them, unless they pay for a study up front. They do pay for a bunch of those. A lot of that money goes to colleges. It’s one of those “drop in the bucket things, though. The National Science Foundation, for example, had a FY2010 budget of $ 6.87 billion. I know, a billion here, a billion there, and pretty soon we’re talking about real money – Barry Goldwater – but it’s like a school district threatening to cut music and sports if they can’t pass an operating levy. Hit the hot-button things, not the things that really cost money and might be more difficult to tackle. NASA’s whole budget is $ 18 billion a year. Cut the whole thing and it wouldn’t help the deficit one damn bit. We’re talking long-term solutions, not the nickel and dime things. I’m not saying there isn’t waste and there aren’t things the government does that are pointless and stupid money-wasters. There are bundles of them. But it’s like saying we’re going to skip lunch today because we’re going to be foreclosed on…the problem is way over the five bucks for that sandwich at Subway. All you get by using the kind of examples Obama used is a sense of us versus them…the rich guys versus we regular folks. But every time he says he’s going to raise taxes on the rich, using his definitions of “rich,” companies hunker down. They don’t invest and they don’t hire. That’s what’s killing our economy now. The Sword of Damocles hanging over our heads is the threat of taxes, especially on small businesses, on top of the health care stuff and the piling on of rules, restrictions and policies various agencies put in place without Congressional approval. But Obama is going to clear all that away. Right. Let me know when that happens. Let me know when drilling the the Gulf and in ANWR starts up in earnest. Let me know when the shale oil fields get going. I hate this us against them crap. He might be able to use it to win, but it will be bringing our destruction. See my previous post about Atlas not shrugging…businesses will move out of the US to countries that will not tax and regulate punitively. This country was founded on that…giving us the freedom to do what we want without arbitrary government interference. When our government turns into King George, you’re going to see a bunch of businesses move out of here. That scares me more than a nuclear-armed Iran, and that scares me a lot.